Issue 28 of the cool Street Art zine Very Nearly Almost comes out this week. Cover artist for Edition 28 is world reknown tattoo artist, graffiti writer, skater, Rebel8 Tee Shirt designer and all round cool dude Mike Giant. The limited edition version of this issue has just been previewed and looks tat-tastic. It’s not just a screen printed cover, it’s a “MIKE GIANT LTD EDITION SCREENPRINTED BOX SET” ..wooooooooo. A refreshingly candid interview with Nick Walker doesn’t gloss over his wobble and fall from stardom’s elevator after the spectacular success of some of his work in Bonhams’ notorious 2008 auction (covered here on Graffoto). VNA have managed to pull together every single member of Da Mental Vapors crew from France for a group interview. This must have been a high risk gambit, those in the know may recall what happened a few years ago when London’s then top street art crew gathered in a room at VNA’s invitation! Say no more. In 2012 Nelly Duff hosted the grittiest and most compelling one night street art event for the past many years in a derelict car park under a council block, well worth checking out the photos and write up of Banger Art on Graffoto. That sensational evening was the first time we came across the intricate, vintage looking illustrations of Dan Hillier, another artist with a great interview in VNA Issue 28. So, there is a great magazine packed full of great interviews, the chance of a very cool limited edition cover version, some superb art on display in a cool gallery and did we mention beer sponsored by Sixpoint Brewery? 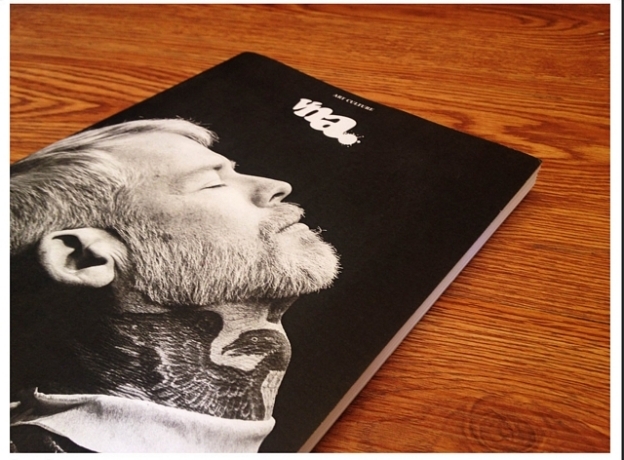 VNA28 featuring #MikeGiant / @giantrebel8 / @rebel8, pictures from #Birdman /@birdmanphotos AND #JamesSharrock @jamessharrock_photo, contributions from #NoWay / @omfgnoway, Damo / @damovna, t-world’s Eddie ‘Goddammit’ Zammit / @eddiezammit, new #GIFFITI from #INSA @insa_gram, artwork from #SMUG @smugone, #Nunca /@nunca_art, #DanHillier / @mrdanhillier, #NickWalker @apishangel, #AlexanderMitchell & Backwoods / @a_h_mitchell @backwoods_gallery, #ChadMuska / @themuska, Berlin’s #1UPcrew /@1up_crew_official, DMV (Da Mental Vapors) / @sowat_dmv @bomk_dmv @jaw_dmv @bruskdmv #INTI @inti_cl and images from the streets by Nadine Emans / @nemans, #ClaudeCrommelin, @hookedblog, #NoLionsInEngland 1XRUN’s Mike Popso and more!!! This entry was posted in News and tagged Art, Dan Hillier, DMV, INSA, interviews, London, mike Giant, Nick Walker, NoLionsInEngland, Nunca, Shoreditch, Smug, Street Art, tattoos on 11/19/2014 by Shoreditch Street Art Tours.